One of the many hats I've worn is producing the "How'd You Do That?" 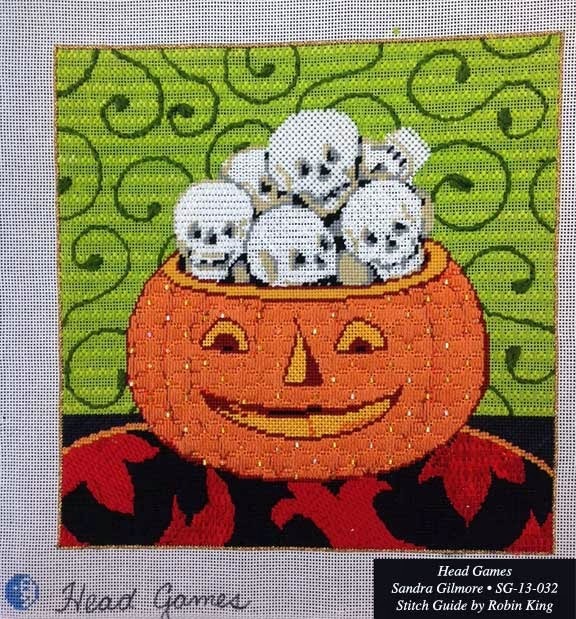 needlepoint DVDs. Pet Project Video was the name of our company. It was a joint venture between myself, Amy Bunger and Pat Ryan (Business Visuals). 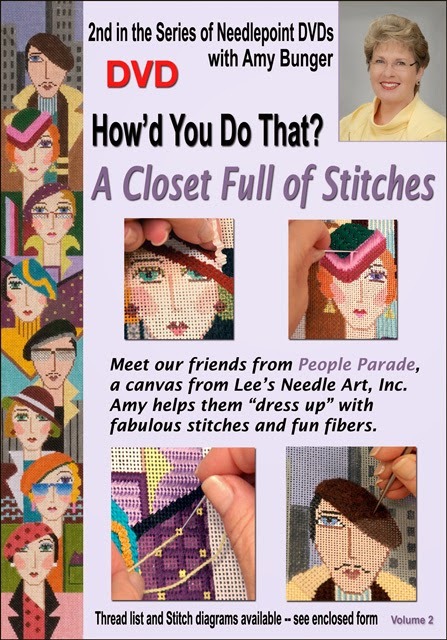 All of the DVDs are still available through your Local/Favorite Needlepoint shops; shops can order from either Amy Bunger or Pat Ryan (Business Visuals) or contact me and I can get you to them. I'd like to re-introduce the DVDs to our blog readers. In this episode, we will first feature DVDs 1-6. 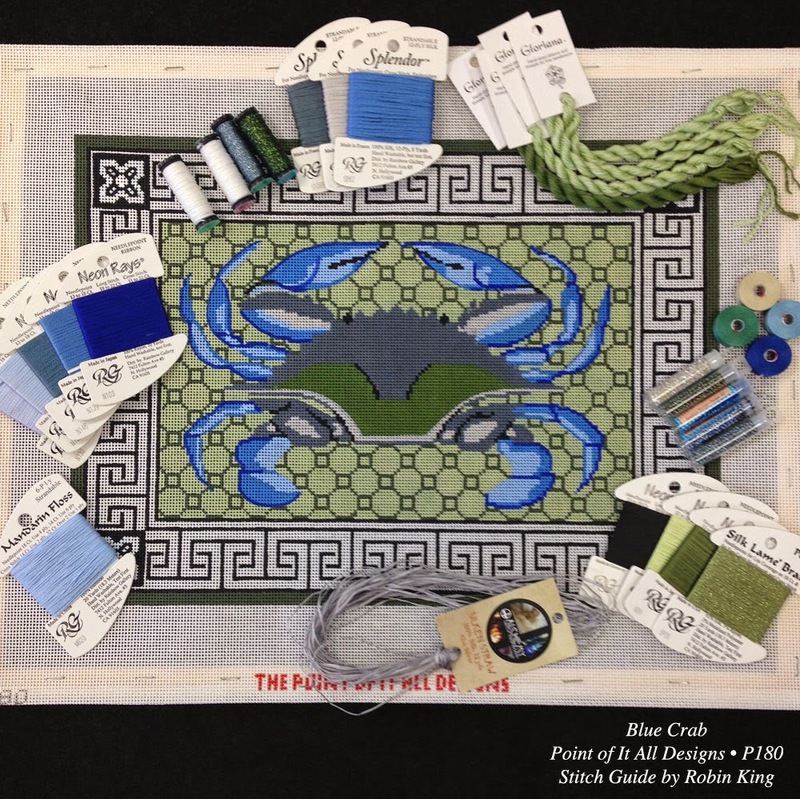 Amy Bunger shares her needlepoint knowledge so others can learn, too. 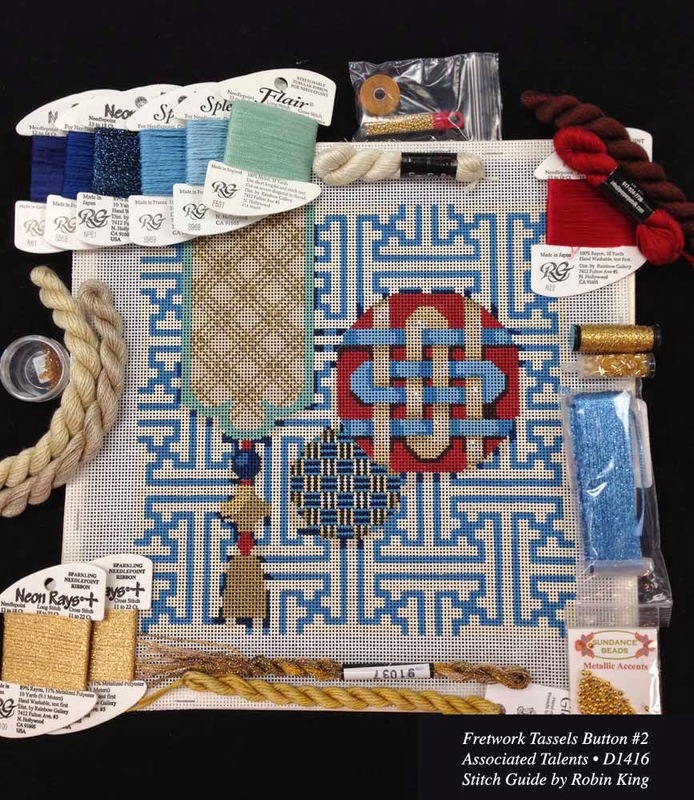 Learn things you never knew, be reminded of things you might have forgotten, and see those tricky 3-D stitches and techniques which are hard to figure out from a one-dimension diagram or chart. 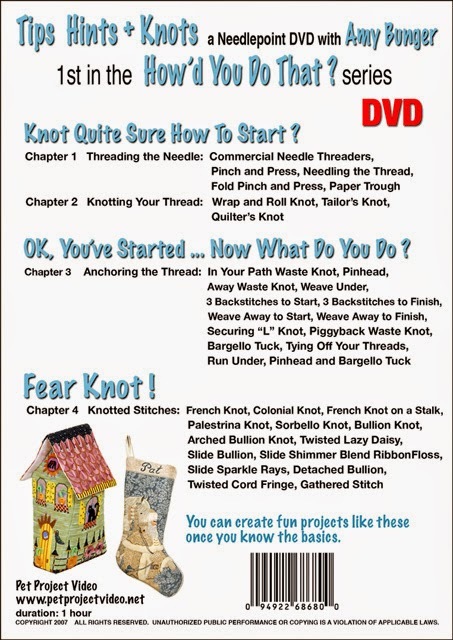 Tips Hints + Knots, 1st in the "How'd You Do That?" 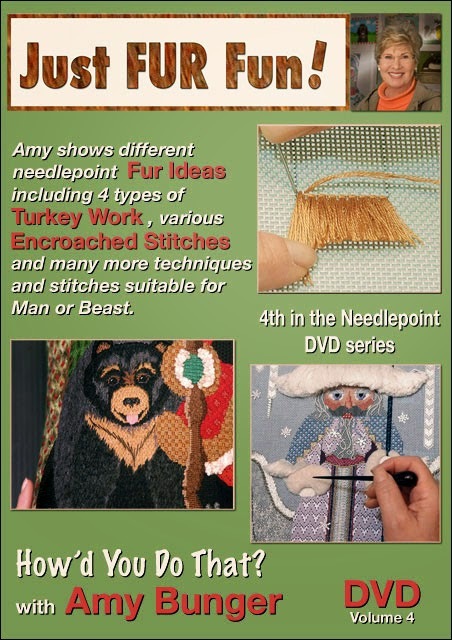 series of needlepoint DVDs with Amy Bunger, is about the art of needlepointing with information for all skill levels. This hour-long DVD has 42 chapters; allowing the viewer to fast forward to the next stitch of inerest, or pause and study. 60 minutes of close-up, clear instruction which you can watch as a movie, or choose from 42 different scenes at the touch of a button. 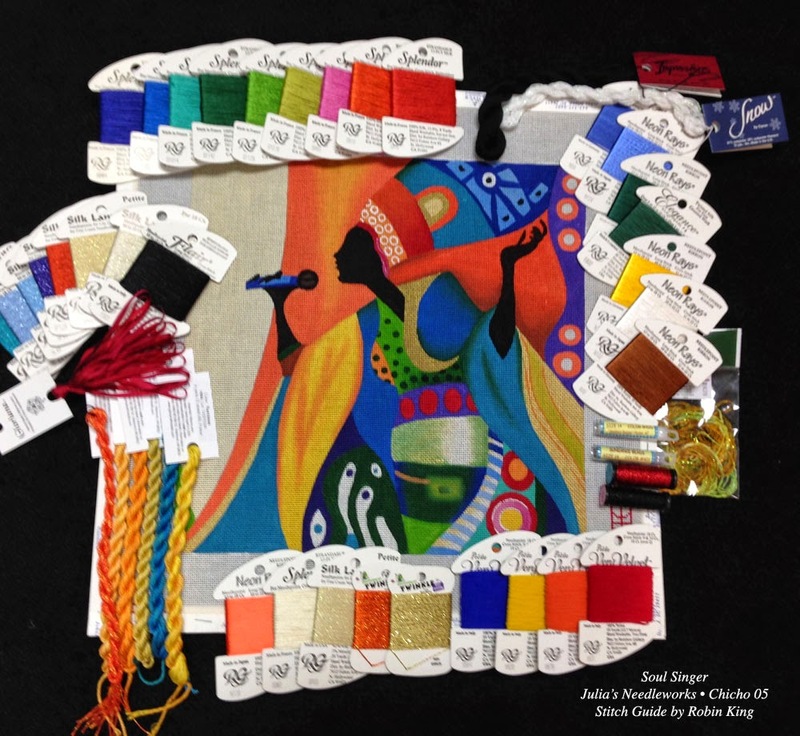 How many canvases have you worked which involve fabric? DVD #2 from the "How'd You Do That?" 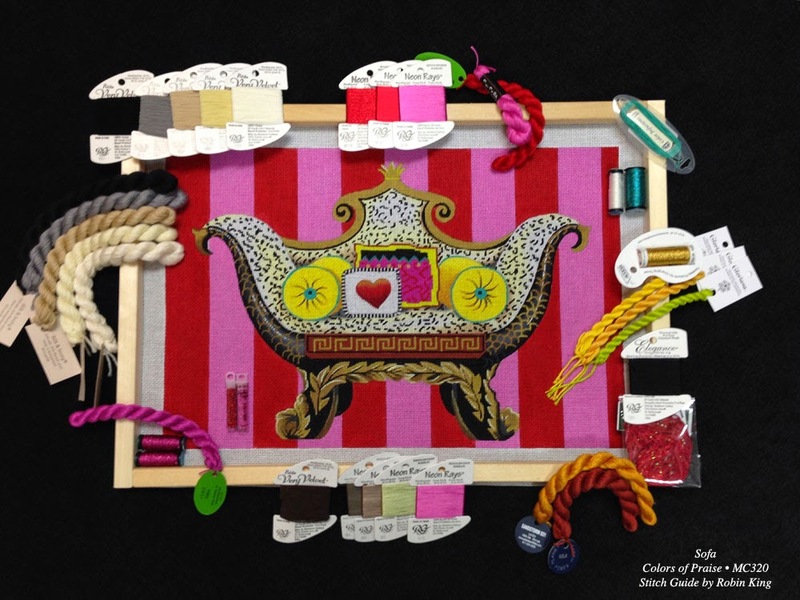 needlepoint series, A Closet Full of Stitches, is filmed to help "dress" your canvas fabrics. 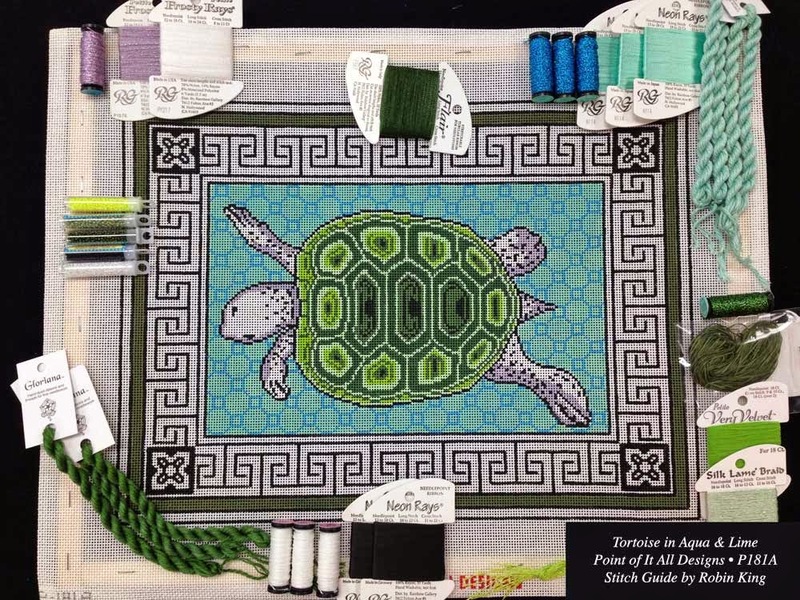 Lee's Needle Art, Inc.'s canvas, People Parade, WH1204, is a natural for demonstrating different stitches and techniques well-suited for fabric textures and clothing ideas. 60 minutes of clear instructions to watch as a movie, pause and study, or choose from 40 different scenes. Mop Tops and Buzz Cuts is the 3rd instructional DVD in the "How'd You Do That?" series with Amy Bunger. 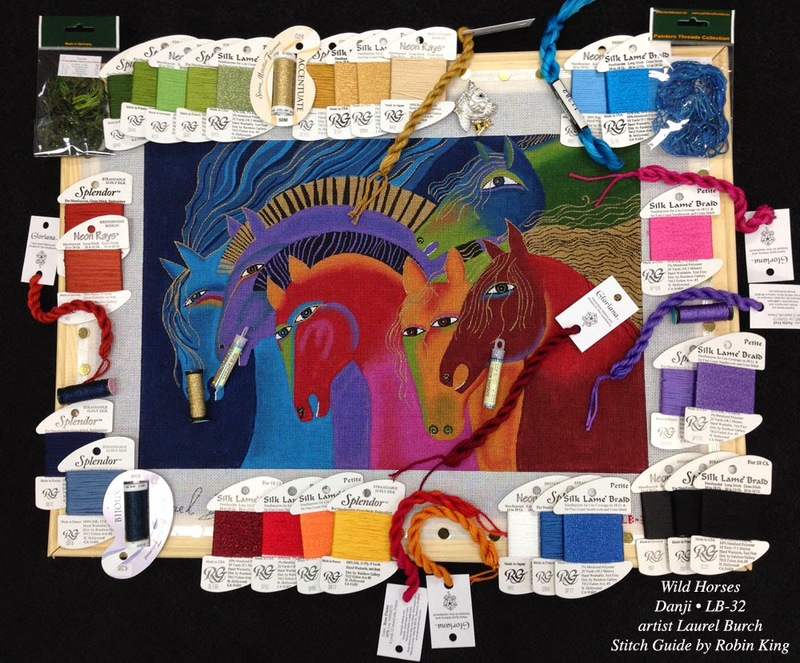 60 minutes of Hair, Beard, Mustache, Eyebrows and Eyelash ideas for Needlepoint. 51 chapters. 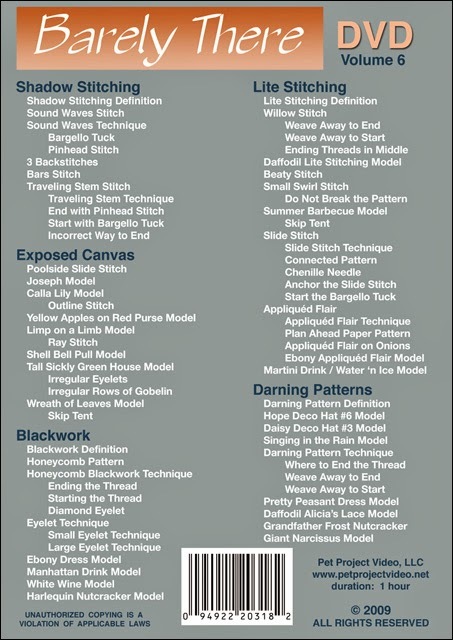 This DVD cleverly shows the unstitched canvas/stitched models transformation appear befor your eyes. DVD #4 Just FUR Fun! Just FUR Fun! is the fourth in the "How'd You Do That?" series of DVDs with Amy Bunger. Watch this movie on how to work a variety of stitches and techniques for FUR (most can be used for hair as well). See real detail on 5 different ways to work Turkey Work. 60 minutes of close-up, clear instructions. Watch it as a movie, or choose from 41 different scenes at the touch of a button. Fancy Flowers is the fifth in the "How'd You Do That?" series of DVDs with Amy Bunger. 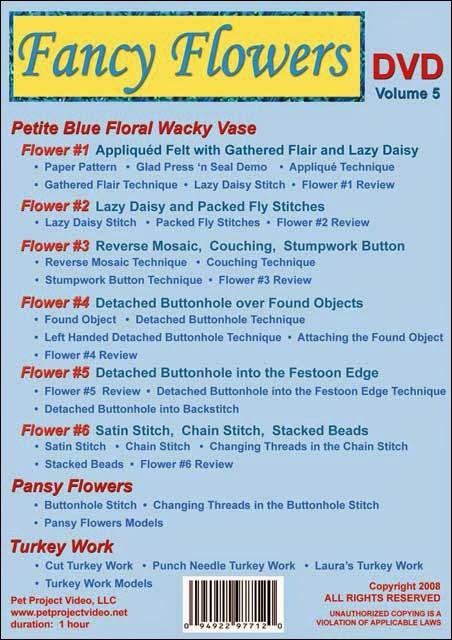 Watch this movie on how to work a variety of stitches and techniques for flowers. See real close detail on Appliquéd Felt, Stumpwork Button Technique, Detached Buttonhole over Found Object, Buttonhole Techniques for Pansy Flowers and Turkey Work for Needlepoint Flowers. 60 minutes of close-up, clear instructions that you can watch as a movie or choose from 42 different scenes at the touch of a button. Barely There is the sixth in the "How'd You Do That?" 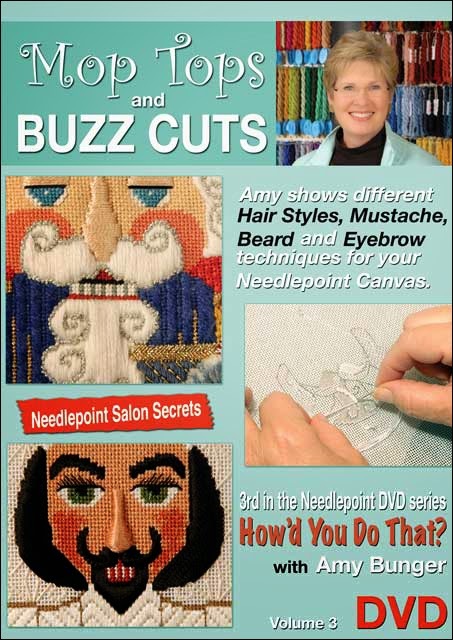 needlepoint series of DVDs with Amy Bunger. Sometimes a "light touch" with the thread and stitch is just the "right touch." 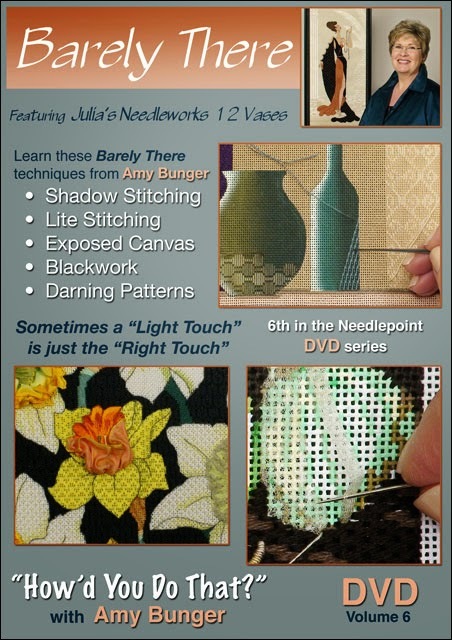 This DVD is full of stitch, thread, and technique ideas that will help you succeed in adding texture and depth to your design while still using the artistry of the original painted canvas. 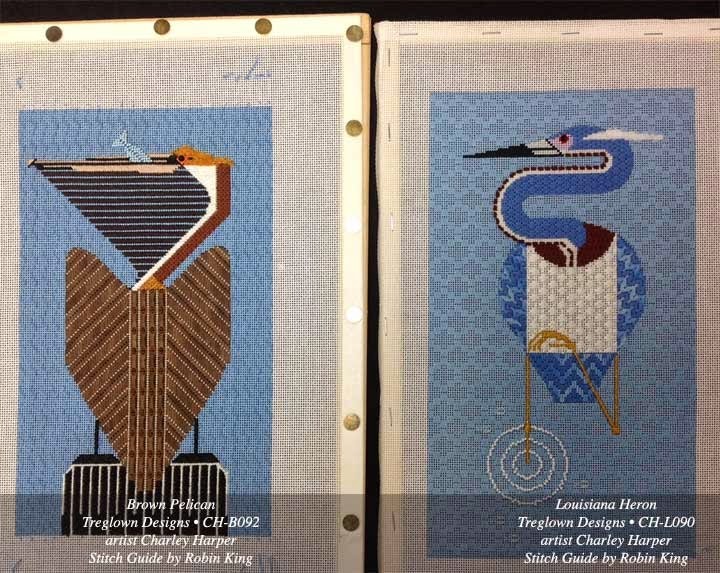 Needlepoint is a textile sculpture and a minimalist approach can be interesting and effective. 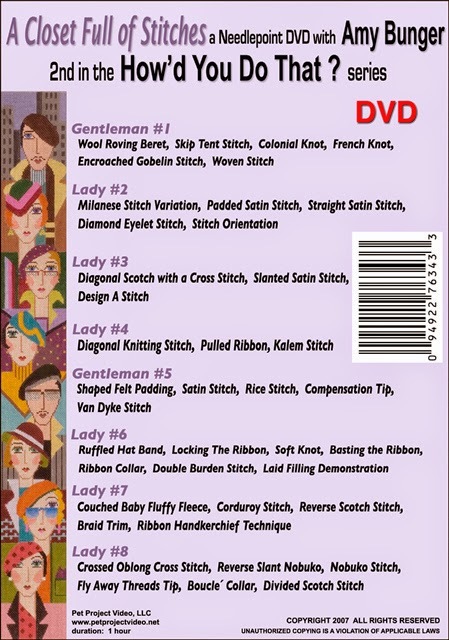 64 Chapters with many stitched models illustrating the Barely There techniques in this 1-hour long DVD. As you can imagine, there is valuable content on these DVDs. You can watch, rewind, replay all in the convenience of your stitching room. 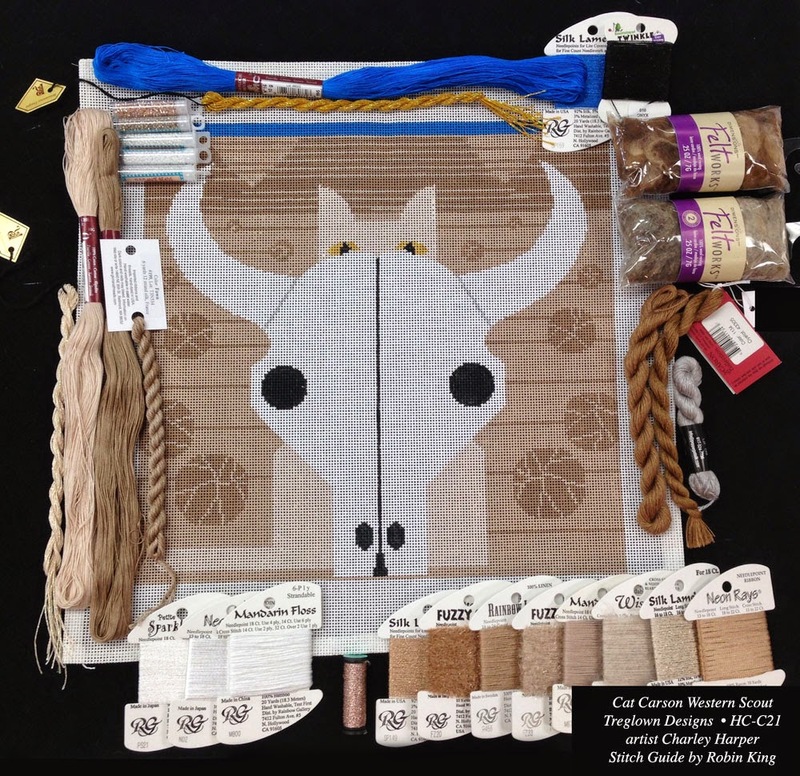 Three days at The Nimble Needle-Atlanta: one day of Help Sessions and two days of Canvas Enhancement. What fun we had! 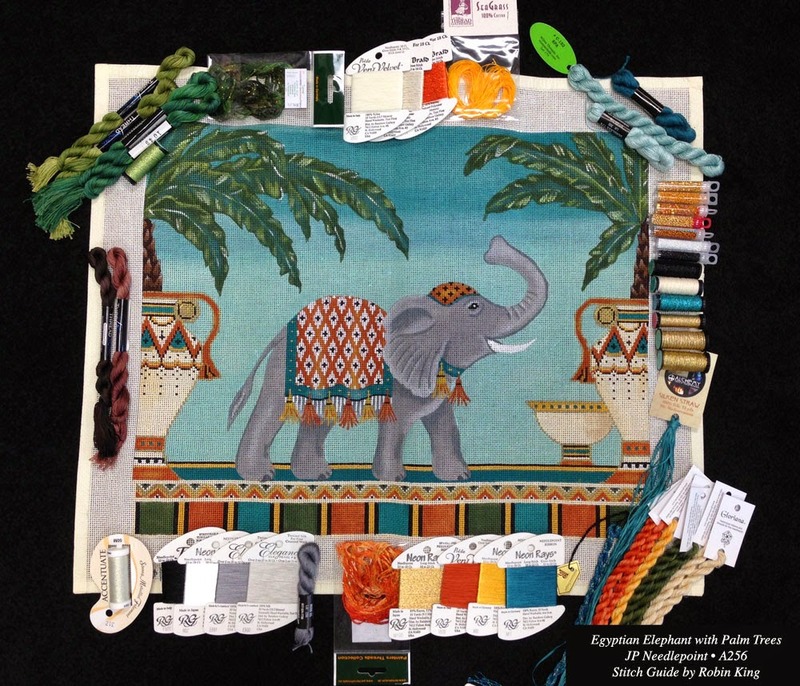 Here was the line up of canvases: Amanda Lawford, Sandra Gilmore, Treglown Designs/Charley Harper, Melissa Shirley Designs, JP Needlepoint, Susan Roberts, Associated Talents, Tapestry Fair, Danji/Laurel Burch, Colors of Praise, Julia's Needleworks/Chicho, and Point of It All Designs. 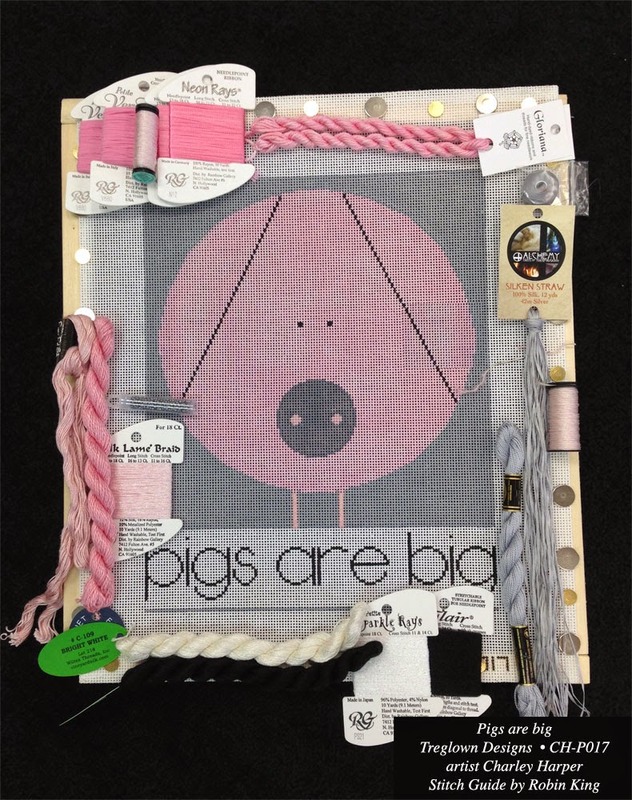 Stacy Brown (owner of The Nimble Needle-Atlanta) took these brilliant "beauty shots." 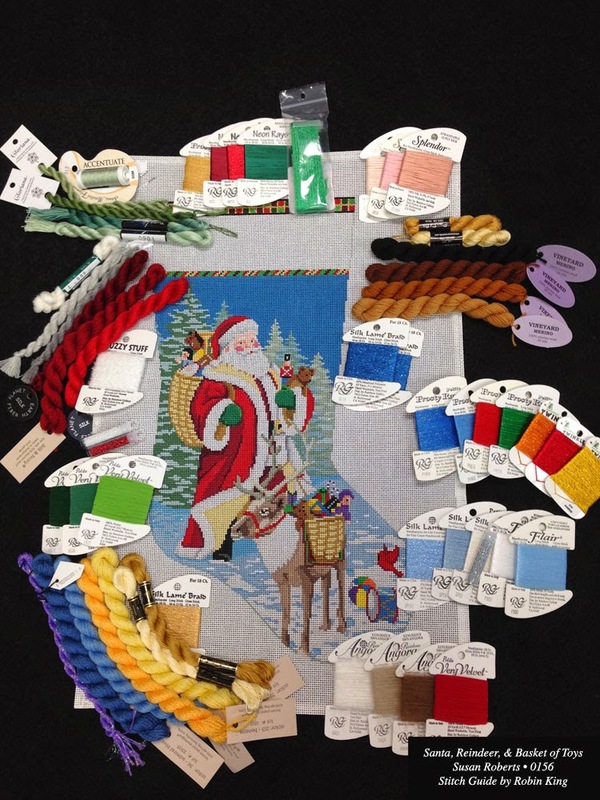 Look at the fun threads, beads and ribbons. 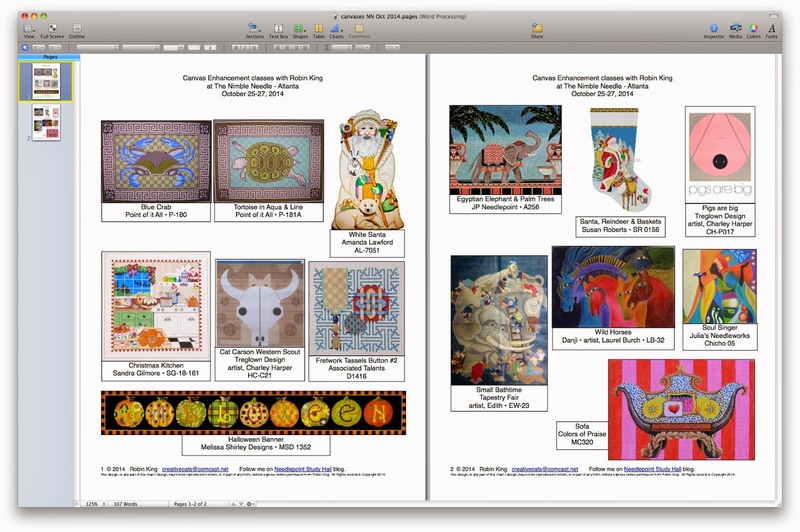 It was a treat to see some finished pieces from my previous Canvas Enhancement classes at The Nimble Needle-Atlanta. 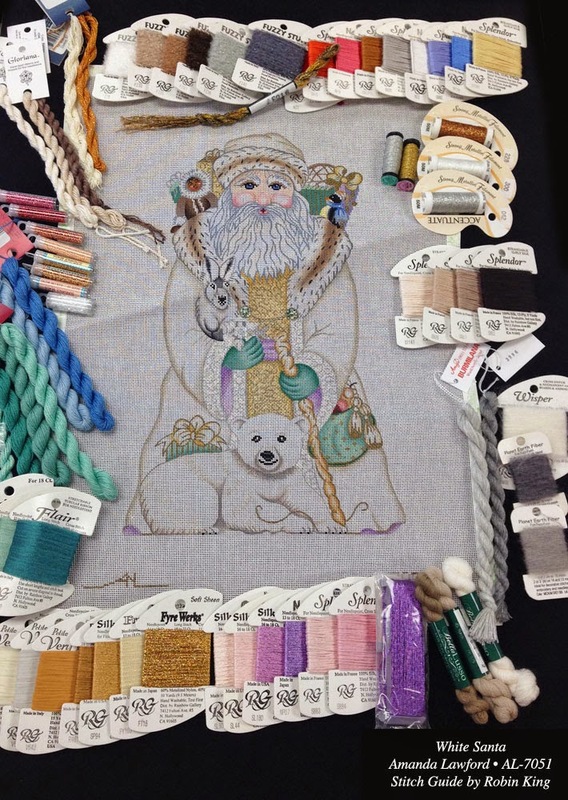 What a talented group of stitchers! 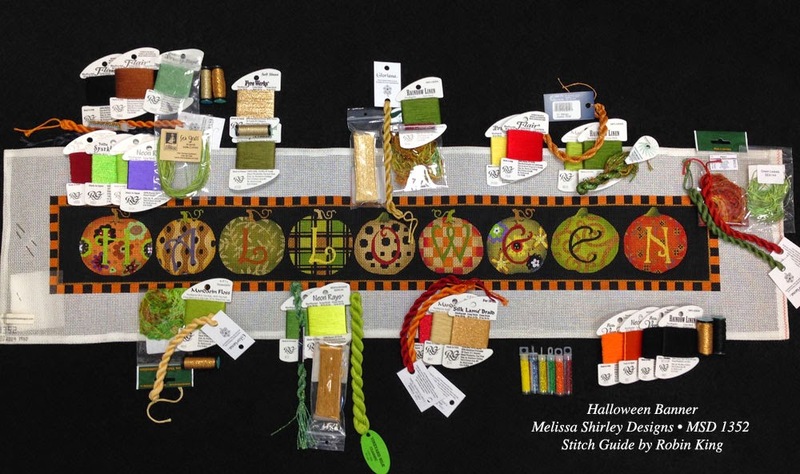 I really enjoy visiting The Nimble Needle-Atlanta and look forward to my return visits in 2015: February, April, July and October. Hope to see you there! It was time to head back home... to board the flight back to Memphis. I had my "celebratory" Pink Lemonade Martini (available only in October); supporting Breast Cancer Awareness. 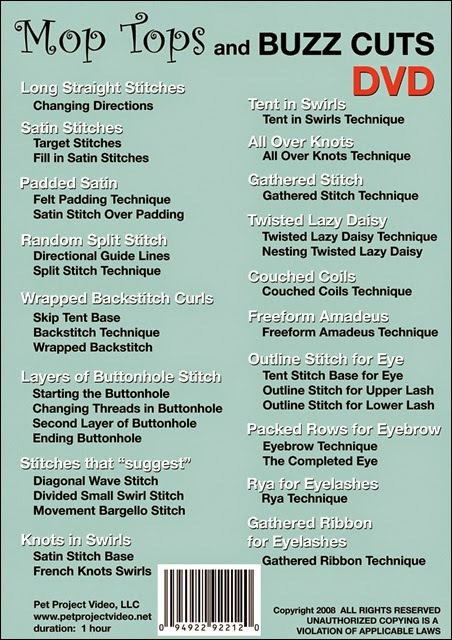 Here's a stitch for you.